Dycem is one of the leading manufacturers and suppliers of floor-level contamination control solutions for cleanrooms and critical environments. The company’s products are solely manufactured in the UK at its Bristol site and are sold globally in more than 50 countries to many of the world’s leading corporations. Today, thousands of cleanrooms, critical areas, and controlled environments are protected by Dycem polymeric contamination control flooring. It enables organizations to reduce particle counts by up to 99.9%, which contributes to eradicating contamination and cross contamination, increasing product yields and profits. The company’s user base of thousands includes blue-chip companies such as Sony, GlaxoSmithKline, Lilly, Abbott, Johnson & Johnson, Motorola, Roche, and IBM, as well as Pfzer, Rolls Royce, Nestle, Bombardier, Intel, Seagate, Takeda, Nokia, Honda, BMW, Heinz, and Texas Instruments. Dycem’s flooring is suitable for both small and large companies as it is flexible, versatile, and can be installed according to individual requirements. Whether the requirement is for a short-term replacement, loose laid, or a more long-term solution, Dycem has an extensive product range to suit a variety of contamination control needs. CleanZone (CZ01) is designed for pedestrian and light-wheeled traffic, including carts, manual pallet jacks, and laundry cages. CleanZone is 2.1mm thick and comes in a range of attractive color options, enabling Dycem’s customers to implement visual clean / dirty areas in accordance with good manufacturing practice (GMP) specifications. WorkZone (CZ02) is designed for heavier traffic loads including pallet trucks and forklifts. Also at 2.1mm thickness, WorkZone is installed with a low-profile edge strip, giving a smooth transition on and off the system and ensuring sensitive loads carried across by wheeled traffic are undisturbed. CZ03 is a loose laid solution and does not need to be installed by Dycem’s service technician team. With a thickness of 7mm, CZ03 is thicker than CZ01 and CZ02 due to its anti-skid backing. Delivered as a complete pre-assembled product, it is designed mainly for pedestrian traffic and light-wheeled carts. Dycem has been manufacturing contamination control zones since 1966, with headquarters in Bristol, UK; Warwick, Rhode Island, US; and Santa Rosa, Philippines. The company was recognized for its manufacturing excellence by being nominated as a finalist for the South West exporter of the year. Dycem also manufactures in compliance with relevant international standards, with a minimum carbon footprint. The company is committed to quality, customer satisfaction, and product innovation, which has earned it recognition worldwide. Today, Dycem operates in most markets serving a variety of industries including pharmaceutical, bio medical, hospitals, medical device, fiber optic, packaging, and food. In addition, by aiming to continuously improve, Dycem has developed the design and ability of its materials to trap and retain particles down to a nano scale. To find out more, please contact Dycem using the enquiry form or details below. Dycem flooring has been developed to create an innovative 'two-tone' system, utilising its range of colours and flexibility to create a more complete contamination control solution. Non-Slip products can be used in a variety of industrial environments, including workshops, laboratories and factories. CZ01 is a high-performance contamination control flooring solution, suitable for light wheeled trafﬁc and heavier pedestrian ﬂows. Permanently installed, it is the most effective way of controlling all forms of foot, wheel and airborne contamination. It is available in a range of attractive designs which means it still looks good between wet cleaning. Our wall panels provide the perfect complement to Dycem flooring, creating a 360° contamination control solution. The Dycem Bench Mat prevents the movement and loss of small components. It is also used in laboratories to cushion and stabilise fragile equipment and protects sensitive products by safely draining static discharge. 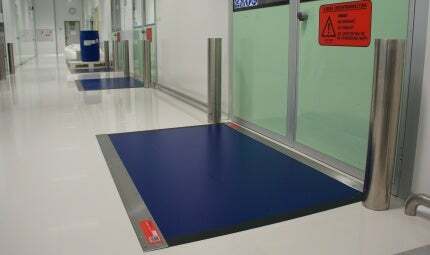 The Dycem Lab Mat is a loose-laid mat for use in entry points and exits to and from the laboratory. This video covers the services that Dycem provides. Controlling contamination and cross contamination at or near floor level is an essential and fundamental part of any integrated risk management policy. Hanmi Pharmaceutical is constructing a new biologics manufacturing facility in the city of Pyeongtaek in the Gyeonggi province of South Korea. Dycem Contamination Control is pleased to announce the launch of a brand new sales hub in Texas, US. Dycem's says its Dycem CleanZone flooring is more efficient than peel-off mats when maintaining cleanroom protocols. Dycem has a sustainable, effective and scientifically proven solution, recommended by most auditing bodies to control contamination and cross-contamination. Healthcare acquired infections (HAIs) cause trouble on hospital wards every year with severe consequences. CleanZone-Flexi is a one to six month replacement system with a proven 99.9% contamination control efficiency. Designed to give you added flexibility with your flooring choices, CleanZone-Flexi provides an ideal solution for short-term contracts or temporary referb areas. The NHS has recently spoken out about its aims to reduce its impact on the environment by making sustainable and responsible purchasing decisions in all areas of its operations. Contamination control specialist Dycem Ltd has recently released CleanZone-Flexi, a flexible new flooring solutionoffering end-users a high performance alternative to peel-off mats, without impacting on daily waste volumes. Installed onto a 1.2mm thick isolator membrane, Dycem's ﬂoating ﬂoor system gives end-users the ﬂexibility of having Dycem self-installed or laid loose, creating fewer disruptions to the day to day running of your facility. Dycem has released images of its newly refurbished office in Asia, which is the most recent of the company's global head offices. NHS Velindre Hospital in Cardiff has witnessed a dramatic reduction in microbial counts, after re-evaluating their contamination control flooring solution. Dycem can be used at all entrances and exits to critical control points (CCPs) to reduce the risk of both viable and non viable contaminants entering the critical manufacturing areas. The control of materials and personnel into and out of cleanrooms and other controlled areas is an important part of contamination control. The main source of contamination in cleanrooms is from people and this risk is increased by the transfer of people within a facility.